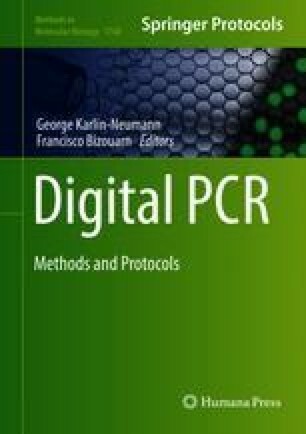 Droplet-based digital PCR provides high-precision, absolute quantification of nucleic acid target sequences with wide-ranging applications for both research and clinical diagnostic applications. Droplet-based digital PCR enables absolute quantification by counting nucleic acid molecules encapsulated in discrete, volumetrically defined water-in-oil droplet partitions. The current available systems overcome the previous lack of scalable and practical technologies for digital PCR implementation. Extracellular microRNAs in biofluids (plasma, serum, urine, cerebrospinal fluid, etc.) are promising noninvasive biomarkers in multiple diseases and different clinical settings (e.g., diagnosis, early diagnosis, prediction of recurrence, and prognosis). Here we describe a protocol that enables highly precise and reproducible absolute quantification of extracellular microRNAs using droplet digital PCR. M.D.G acknowledges initial support from a Rio Hortega Fellowship and later from a Martin Escudero Fellowship. M.T. acknowledges support from the Department of Defense Peer-Reviewed Cancer Research Program Award CA100606 and NIH US National Institutes of Health Transformative R01 grant R01DK085714.